Columbia, Mo. 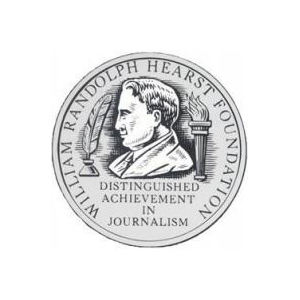 (March 24, 2004) — Missouri School of Journalism students Ann Friedman and Ann E. Stratton are among the top 10 winners in the personality/profile writing competition for this year’s Hearst Journalism Awards. Friedman won first place in the competition; Stratton won eighth. Friedman, a senior from Dubuque, Iowa, won a $2,000 scholarship for her article “Nerve Mending,” which was printed in Vox magazine. The article was a profile of Dr. John McDonald, who believes that patients with spinal cord injuries can move again. With her win, Friedman is now eligible to participate in Hearst’s National Writing Championship in San Francisco this June. Vox is a weekly city magazine that is widely distributed in mid-Missouri. Stratton, from Frederick, Md., won a $500 scholarship for “Hard Lessons,” a story about the struggles and success of Willie Mae Hall, a home-school communicator for Field Elementary School in Columbia, Mo. The Missouri School of Journalism is currently in second place in the overall Intercollegiate Writing Competition, with five of six contests complete. Previously, Carolyn Szczepanski won first place in the in-depth writing competition; and Duaa Eldeib won fourth place and Alyssa Ford won 17th place in the feature writing competition. Winners of the spot news contest will be announced later this spring. The Hearst Journalism Awards Program is conducted under the auspices of accredited schools of the Association of Schools of Journalism and Mass Communication, and full funded and administered by the William Randolph Hearst Foundation. It consists of six monthly writing, three photojournalism and four broadcast news competitions, with championship finals in all divisions. More than $400,000 in scholarships and grants are awarded annually. The Missouri School of Journalism provides students hand-on experience using the proven “Missouri Method.” Students become professional journalists by working in real newsrooms, such as the Columbia Missourian, Vox magazine, KOMU and NPR-member station KBIA. Founded in 1908, the School nears a century of setting the standard in journalism education.